A stickpin is a long pin, worn vertically, with a decorative top. Stickpins’ traditional purpose was to secure a tie or scarf but they are now currently worn as a lapel ornament, either singly or in groups. The motif atop these pins can vary widely from a simple pearl or gemstone to whimsical designs such as animals, horseshoes, flowers, gold nuggets, mythological creatures, bugs, busts, cameos, just about anything. Stickpins all have one thing in common, the long pin that completes them. This pin can be straight or twisted (for security) and sometimes has a protective cap to place over the pointed end to help keep the pin in place. 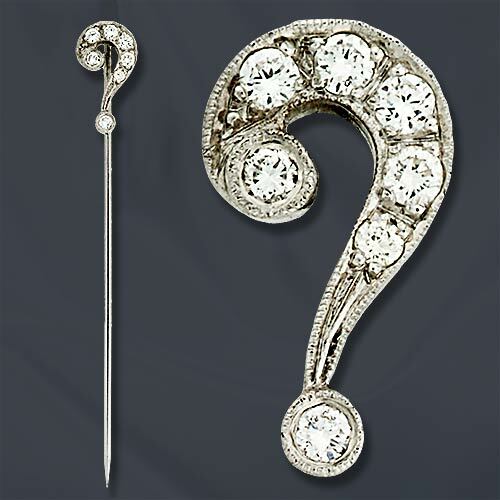 Diamond & White Gold Question Mark Stickpin. 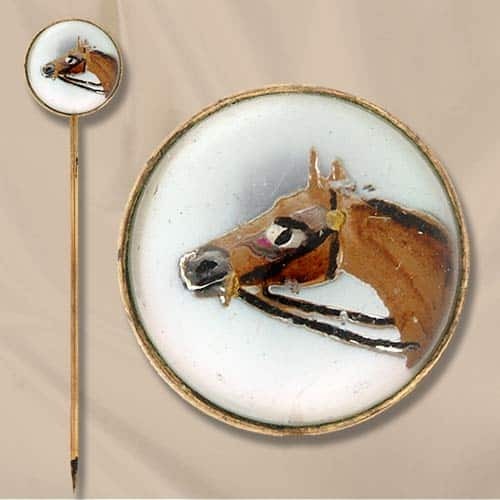 Victorian Reverse Crystal Intaglio Horse Stickpin. 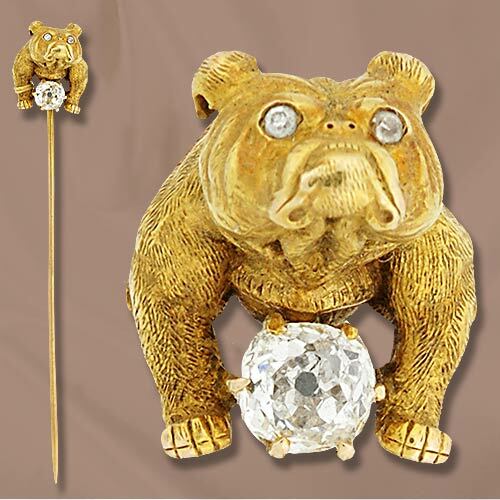 Victorian Diamond & Yellow Gold Bulldog Stickpin. 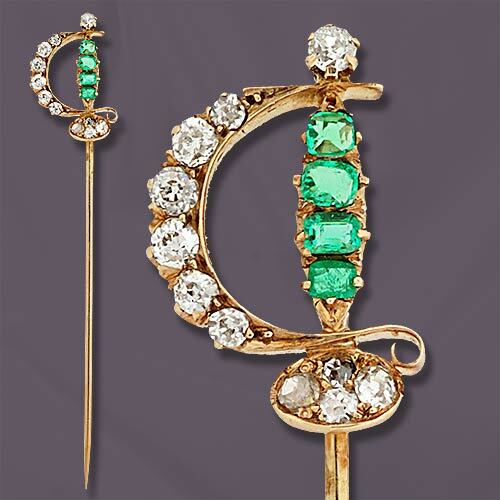 Victorian Emerald, Diamond & Yellow Gold Sword Stickpin. 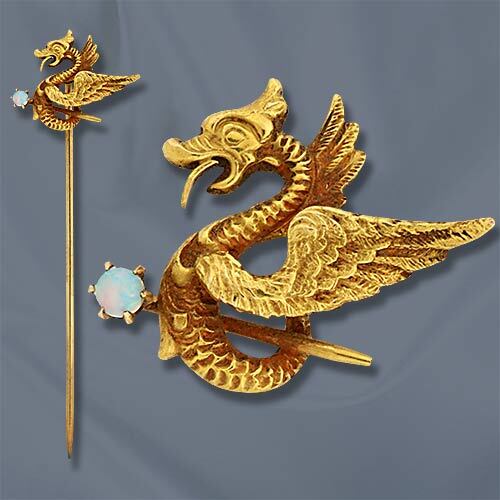 Art Nouveau Opal & Yellow Gold Griffin Stickpin. 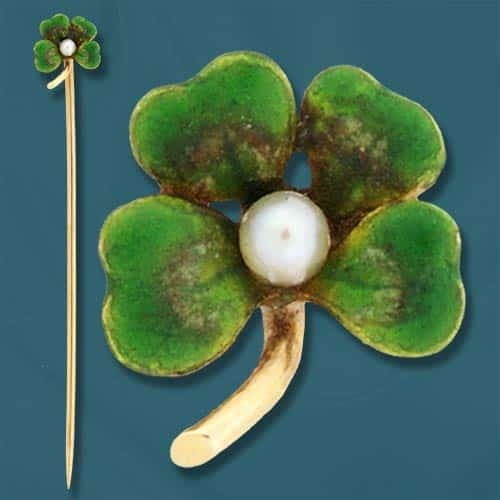 Victorian Enamel, Pearl & Yellow Gold Shamrock Stickpin.